PORTLAND, Ore. (August 13, 2018) – On August 1, Northwest pear growers released their latest crop estimate for the 2018-19 season. Based on data reported from Washington’s Wenatchee and Yakima districts and Oregon’s Mid-Columbia and Medford districts, this year will be the fourth largest crop in history. While the initial season estimate came in at 18.9 million standard box (average 44 lbs per box) equivalents, or approximately 415,000 tons of fresh pears, the current estimate is around 20.2 million standard box equivalents, or 444,400 tons. Picking has already begun throughout the four growing regions of the Northwest and will continue throughout August and September. Pick dates for the 2018-19 season are taking place roughly a week earlier than last season, staying close to the historical average. Starkrimson harvest has begun in most districts, with the Bartlett picking starting this week. Later in the month, harvest of Comice, Bosc, Forelle and Seckel will begin with Anjou harvest commencing in September. Out of the leading varieties, the current estimates for this season are 9.9 million standard boxes for Green Anjou (about 49.2% of total Northwest fresh pear crop), 5.3 million standard boxes of Bartlett (26.0% of the total crop), and 3.2 million Bosc (15.7% of the total crop). Red Anjou will represent 5.1% of the crop with about 1 million standard boxes. The organic pear estimate is expected to come in at 2 million standard boxes (44,000 tons), which would make up 10% of the total Northwest crop. Newly transitioned orchards and a strong pear crop overall have contributed to the growth in organic pears. Out of the entire organic crop, growers project 753,250 standard boxes of Green Anjou, with the Green Bartlett and Bosc crop sizes projected at 698,350 and 384,100 standard boxes, respectively. The majority of consumers want to eat their pars within 1 to 3 days of purchase. 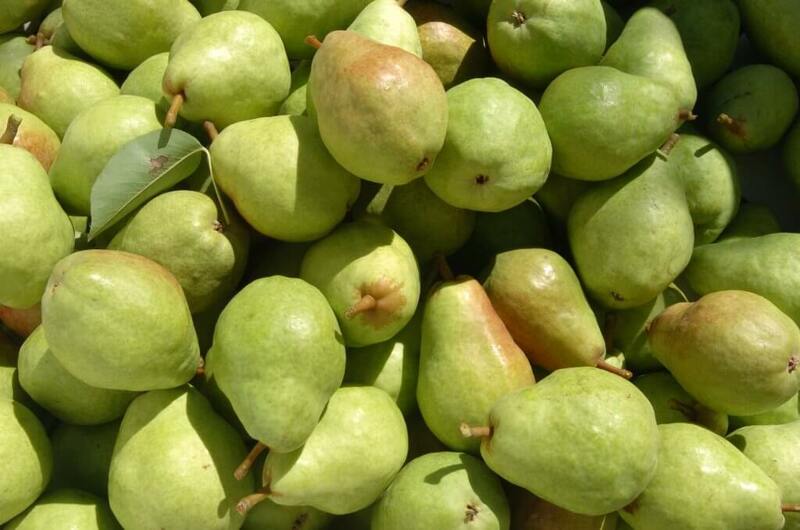 This season, PBNW will re-invigorate the conditioned pear program, working closely with retailers to satisfy consumer demand for pears that are ripe and ready to eat. PBNW will also be expanding omnichannel promotions with retailers, including program development with social media and supermarket dietitians, as well as time honored support of displaying multiple varieties, display and training contests, plus print and targeted digital ad promotions. One new piece of this year’s marketing initiative will be a series of videos that focus on growers and the pear industry as a whole. The PBNW international team will be focused on activities in top markets for the 2018-19 season – Mexico, Central America, India, Middle East and Asia – with in-store sampling, nutrition workshops, consumer advertising, movie promotional tie-ins, social media and event activations. To combat the increase in competition in many of the export markets, PBNW will initiate 1-2 month long promotion agreements with key retailers to increase shelf space, and improve space and location with USA Pears on ad in the stores. Pear Bureau Northwest is a non-profit marketing organization established in 1931 to promote the fresh USA Pears grown in Washington and Oregon, home to 88% of the US commercial fresh pear crop. The Bureau represents close to 900 grower families and partners with outlets throughout the world in an effort to increase overall success with the pear category. The organization provides marketing and merchandising expertise that is customized specifically for each retail organization, using its pear consumer research findings as well as individual store analysis using an in-house data system that measures pear category performance nationwide and third-party research to show retailers how they perform versus their competition. Retailers who are interested in partnering with Pear Bureau Northwest should contact them at info@usapears.com or 1 (800) 547-4610, as well as visit the Trade.USAPears.org website.